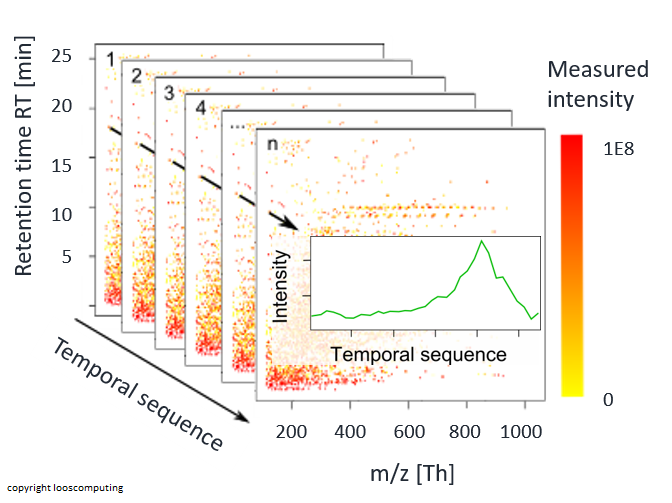 enviMass is a data-mining workflow for the automatized detection of intensity patterns in hyphenated (LC / GC) mass spectrometry (MS, MS/MS) measurement sequences, including a growing bundle of additional functionalities such as targeted screening, nontargeted peak grouping, homologue series detection or quantification. enviMass is freely available for NON-COMMERCIAL usage and for all contributors. For COMMERCIAL usage, certain steps in the workflow can only be operated as part of an enviMass Software- & Support-Package. This Software- & Support-Package also provides in-depth support and customized adaptions. Please → contact us for more information. User-friendly and interactive interface + project structuring to handle your mass spectrometry data with a large and growing set of analysis tools. Cross-platform processing of SCIEX, Thermo, Agilent and Waters LC-MS formats. File upload (.mzXML format; direct conversion and upload of Thermo .raw files via ProteoWizard supported); batch file upload from folder. Multi-core processing and adapative workflow structure: changes in parameters, compounds, files or workflow choices are traced and calculations adapted accordingly to minimize computational costs. Auto-parametrized noise removal, chomatogram extraction (EICs, XICs), peak picking and interactive data visualization. Upload of suspect, target and internal standard compounds and resolution-specific calculation of their isotopic patterns. Intensity normalization; based on median intensities or labelled internal standards. Compound screening; includes filewise interpolation of limits of detection (LODs) and a combinatorial algorithm to find the most plausible matches of compound isotopic patterns. Blind and blank file annotation and subtraction steps. Quality control steps, outlier detection in intensity distributions. Isotopologue (Sciex TOF, most Agilent and Thermo Orbitrap instruments) and adduct grouping, filewise and cross-file componentization. EIC correlation, e.g., to hint at in-source fragments, dimer formation or other unusual ESI adducts. Homologue series detection and visualization. Estimation of atom counts for nontarget components. Profile trend detection; works for hundreds of uploaded files and several thousand profiles. Processing of DDA, DIA, SWATH MS/MS spectra. Filtering of tandem mass spectra for nontarget profiling. Editor for defining user-specific comparisons to trace different intensity changes across processes or statistical test on intensity changes. Calibration, quantification and recovery with/without internal standards. Workflow data availability in the R statistical environment - countless possibilities for custom-tailored analysis such as large-scale clustering, PCA or simple Venn-diagrams. Handles positive and negative ionization modes in one project.